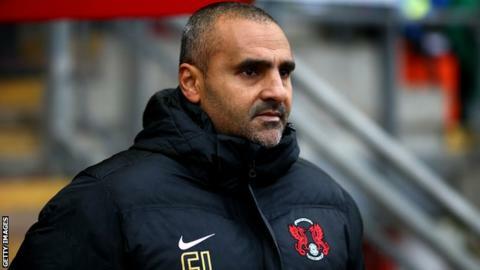 Leyton Orient manager Fabio Liverani says his squad still have the quality to survive relegation from League One. The O's are two points from safety with two games of the season remaining after Tuesday's 1-0 defeat at Rochdale. "Clearly we have to win both games and, at the same time, have to hope that the other teams don't do better than us," the Italian told BBC London 94.9. "I believe in the players and believe we have the quality to win both games. Then, we will see." Liverani has won eight of his 25 games in charge of Orient since taking over at the east London club in December. Last month, the 38-year-old former Lazio and Fiorentina midfielder set his side the target of reaching 53 points - a total they can still achieve if they win their fixtures against Sheffield United and Swindon. Orient finished third last season and were beaten in the play-off final but have struggled since and were taken over by Italian businessman Francesco Becchetti last summer. "The president has put a lot of money into the club and should be more disappointed than anyone else," Liverani added. "He is funding the club and receiving much less joy and much more disappointment than he probably was expecting this season. "We have to do our very best in the last two games and then after then we will draw a line and understand what happens next."